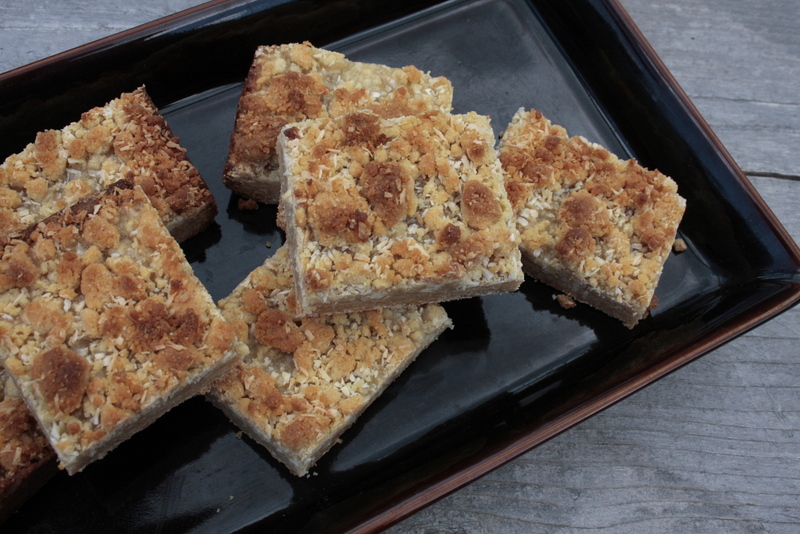 mojito coconut bars | eating with S.O.L.E. These gluten Free lime and mint jelly bars with coconut flour and chick pea flour make for a truly guilt free tropical escape. These bars started with an adventure in mint mojito jelly making, and ended with a truly special gluten free cookie bar. Lets start with the canning adventure: My intention in the canning process was to make a small run of mint jelly to be used for roast dinners (along with 2 other jelly batches I had been waiting for sunny day and some free time to set out on), One of my interns Dave who I tough how to make jam a little while back, jumped in to learn the jelly making process, and I think at the end of it all, he and I had a refresher on what NOT to do! I made a batch of spruce tip jelly, that turned out truly lovely (a little cloudy for my liking, but the tips once set overnight in water made a cloudy liquid, say la vie), Batch number two Dave jumped in and I had him measuring sugar and pectin, I use pomonas pectin which is a two part process; powdered pectin and a liquid calcium water to help the juice absorb and dissolve the pectin powder. We were discussing doubling the batch to account for all the mint I had foraged the day before and somewhere along the line, after stirring and stirring trying to dissolve the sugar in the mint tea I realized something was wrong, Dave quickly accounted for his measurements and we realized the sugar volume was doubled! Yikes, but now the pectin was in the pot and time was of the essence… we decided to try to save the lot by quick brewing an additional batch of tea, and then racing to add it to the sugary pectin mix along with more pectin and calcium water. The real challenge was getting the sugar to dissolve BEFORE the pectin set…arg! After some tense stirring and skimming and setting, I believe we had maybe made it work, we canned the lot with crossed fingers and in the end had a HUGE but lovely batch of mojito jelly. After that chaos I set out to finish the jelly making with another of my favorite seasonal preserves; dandelion jelly. While I was portioning the sugar, Dave and I were discussing how things went so wrong with the mint batch; 4 of this 8 of that double down this (way way too much math while jelly multitasking) I ended up doubling the pectin in my dandelion batch! ARG… there was no correcting this glumping mess. I got out the immersion blender to blend everything up and canned up 6 jars of bubbly champagne looking dandelion jelly… which admittedly taste divine still, it just doesn’t look as stunning as last years batch. 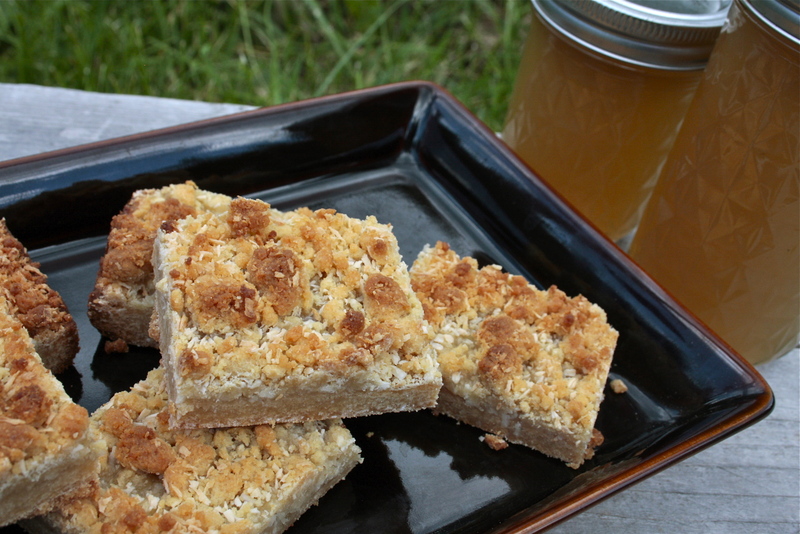 So when life gives you lime mint jelly: make mojito bars! crumble the remaining coconut dough over the top and return to the oven for another 30 minutes or so. You want the top to be golden and the bottom to be set. Allow to cool before cutting and serving. I felt like after our mint canning adventure this sweet treat was well earned!